With widely accepted aesthetic sensibilities changing so frequently, it can be difficult to keep track of exactly what qualifies as "modern" bathroom decor. Some expert sources have weighed in on the topic. For example, Better Homes and Gardens states that a certain elegant simplicity is fashionable in today's world of bathrooms. 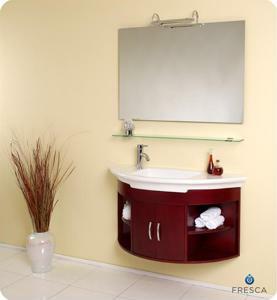 Designs for contemporary bathroom vanities should be glossy, direct and functional. For a set of utterly modern bathroom decor materials, glass, metal, possibly concrete and an overall flair of minimalism are encouraged by the source. Better Homes and Gardens Television points to a specific bathroom designed by Christopher J. Grubb featuring a golden sink with a surface covered in indents, a back-lit mirror and a vanity that resembles a desk more than a place where a person would traditionally think to brush his or her teeth. In an interview with Freshome, Grubb explained why he considers bathroom decor both an art and a science. "The science part is there as a function to first fulfill. How the space is used. The needs in the space. And at the end of the day it is a business," he said. "The art is the use of the abundance of decorative items available. Especially something you can use in an unexpected innovative way." It's not that hard to think of bathroom decor in terms of having modern or antique styles. But the same can be said for accessories. After all, what is a vibrating toothbrush if not modern? An online information provider called Elite Home Tips compiled some suggestions for people who want to keep knickknacks around their bathroom as stylish as the decor. Tumbler holders were noted as an element that could add some character to a lavatory, not to mention hold a toothbrush. A bottle trap for containers of soap may have a similar effect. But let's not forget - there's more to being modern than aesthetics. For example, Elite Home Tips points out that a waterproof MP3 player would be an obviously welcome addition to any music lover's bathroom, especially if he or she enjoys singing in the shower - which can be a lively way to start a day. Even if you're not a terrific singer, nothing makes you feel like a rock star before breakfast quite like belting out Bon Jovi's "Livin' on a Prayer" before you've even had your coffee.